Through a Mitacs Elevate fellowship with Humanitas Solutions, a Montreal start-up that partners with humanitarian organizations, David is working alongside a team of developers on an remotely piloted aircraft project that will one day play an important role in relief efforts for humanitarian organizations. Drone technology is often used by organizations for aid, development, emergency response, and disaster preparedness. However, the aircrafts often require expertise and extensive training to operate. David’s project involves designing software that will make drones easier to fly, allowing humanitarian workers to pilot them without the need for a remote control or a lot of training. “Flying drones is quite complex and usually requires using experts. We don’t want humanitarian workers to have to worry about how to use them while they are out in the field,” says David. 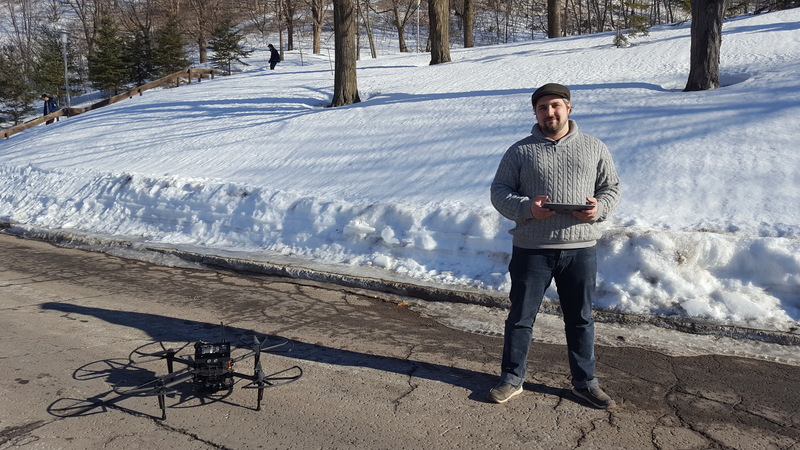 Humanitas Solutions’ intelligent software will allow field workers to fly drones with devices they have readily available like a tablet or smart phone. Once the drones’ embedded intelligence is fully designed, they will be used by organizations to build communication networks to connect workers in areas where infrastructure is down, map locations in real time, scan buildings to assess their safety, and transport data, such as videos or maps. The company’s ultimate goal is to provide free software and technology packages to humanitarian organizations to help their efforts. Working at a start-up means David’s colleagues share his enthusiasm for technology. “Everyone is really dynamic, really excited about the work they are doing, and open to ideas,” cites David. “I chose this project because of the work the company is doing with humanitarian organizations. I really think we can make a difference with our software and help our partners improve their relief efforts. “Together, we hope to empower emergency teams and help them to save more lives.” With a job offer on the table following his fellowship, David is excited to see his research take flight. Mitacs thanks the Government of Canada and the Government of Quebec for their support of the Elevate research internship in this story. Across Canada, the Elevate program also receives support from Alberta Innovates, the Government of British Columbia, the Government of New Brunswick, the Government of Newfoundland and Labrador, the Government of Nova Scotia, the Government of Ontario, the Government of Prince Edward Island, the Government of , and Research Manitoba. This research is jointly supported by NSERC and Mitacs through a funding partnership.